The name The Prophet was selected as the title for this student journal due to the Boston University School of Theology’s reputation as “The School of the Prophets.” The Martin Luther King, Jr. Professor of Ethical Leadership at Boston University is Dr. Walter Earl Fluker. He often encourages current students to consider how we might continue the school’s legacy of prophetic witness by considering how our theological education might form our contributions to lead at the “intersections where worlds collide.” In the closing months of 2018, it seemed like different ideas, communities, and worldviews were colliding constantly, both in the global news and in local conversations. 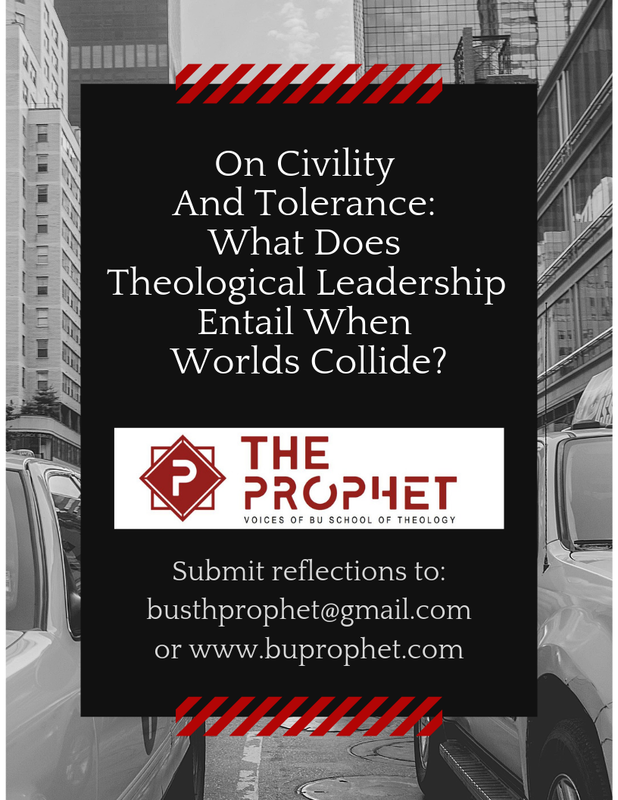 In response, The Prophet issued a call for submissions from our students with their answers to the question, “On Civility and Tolerance: What Does Theological Leadership Entail When Worlds Collide?” We are pleased to share with you over upcoming weeks some of the profound responses we received, as offerings from the diverse voices in our STH Community.